Say goodbye to boring presentations. 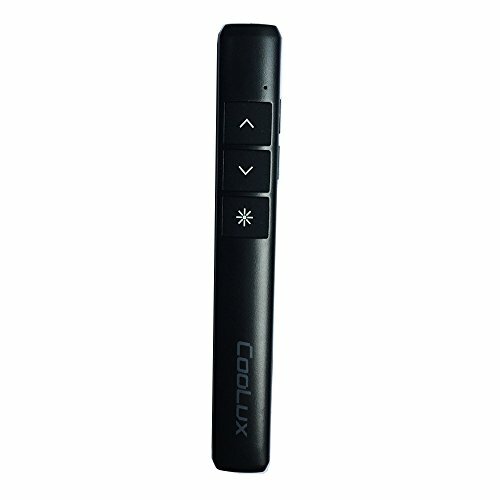 With the COOLUX Wireless Presenter CP01, it's easy to turn your presentation into an audience-grabbing showstopper. Everything you need to control your slideshow with confidence is in the palm of your hand. Advance or go back through your slides at the touch of a control key. Focus their full attention on your most important points with the bright red laser pointer. Move around the room and engage your audience with reliable wireless range of up to 320 feet. Whether you're presenting your master's thesis in the classroom or your weekly sales update in the conference room, just point, press and prepare to impress. Intuitively placed touch-keys put all the controls you need right at your fingertips. Press forward or back to move through your slides. Press the laser pointer key to highlight your point. Start or stop your presentation when you're ready or use the black screen button to shift the attention back to you. The contoured keys are located in just the right place and easy to find by touch. So your show goes smoothly, even in the darkest room. Significant statistic? Eye-opening customer insight? Criticial action item? The red laser pointer gets the whole room focused on your most important points. And because it's easy to see against almost any background, you can be sure they won't miss the point. Stroll around every corner of the conference room. Or present from the middle of the classroom. With your handheld CP01 presenter, you have the freedom to come out from behind the computer or podium and connect with your audience. Plug the reliable 2.4 GHz receiver into your computer's USB port and you're ready to start the show. There's nothing you have to set up and no softwareto install. Light weight and small size(18g only):Bright with you in anywhere, bag, pocket, even wallet. It is only a pen size. Shipping with one Coolux Wireless Presenter CP01; One wireless mini receiver; One USB cable. One Carrying case. One Quick Start Guide. Presenter Size:21 x 12 x 4.5 mm (0.82x0.8x0.18inch). Weight: 0.63 oz (18 g). Build-in PLIB battery (160mA ):No need wary where to by battery and do not need to worry power off. Rechargeable battery ,and same interface Android phone. It is working about one week with full charge.